Gov. Ralph DLG Torres gave the “all clear” sign at 8am Friday as recovery and relief efforts are now underway on Saipan and Tinian, with Super Typhoon Yutu continuing to move westward away from the Marianas. The latest weather bulletin, released by the CNMI Homeland Security and Emergency Management Agency, had Yutu about 345 miles west-northwest of Saipan and Rota, and 345 miles west-northwest of Tinian. 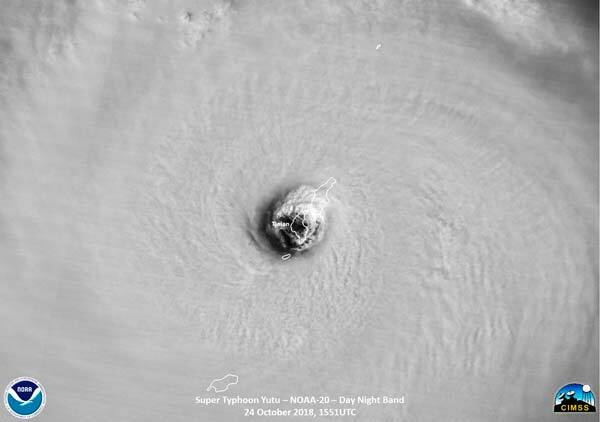 Satellite images released by the National Oceanic and Atmospheric Administration revealed that Yutu’s eye totally encircled the island of Tinian, which has a total area of 39 square miles and elevation of 561 feet. Yutu brought extensive damage to Saipan’s southern part, with houses, stores, facilities, and establishments either destroyed or totally leveled by Yutu’s over 150-mile-per-hour winds. For almost seven hours, from late Wednesday night to early Thursday morning, Yutu brought down wooden and concrete power poles, uprooted decades-old trees, swept away houses made of light materials, ripped tin roofs like it was just paper, and pushed everything in its path, including containers that weigh thousands of kilograms and twisted metal chain-link fences. There’s one confirmed dead—a 44-year-old female who reportedly sought shelter in an abandoned building in the village of Chalan Kanoa, when it collapsed on her. There were reports that hundreds were injured from projectiles brought by the Category 5 cyclone. The territory’s only hospital on Saipan said it received 133 people in the emergency room Thursday, and three patients had severe injuries that needed surgery. There were reports that Yutu brought down a total of 400 power poles while another 50 were only being supported by loose power cables. There were speculations that it will take at least five months to restore the power on both the islands of Saipan and Tinian. 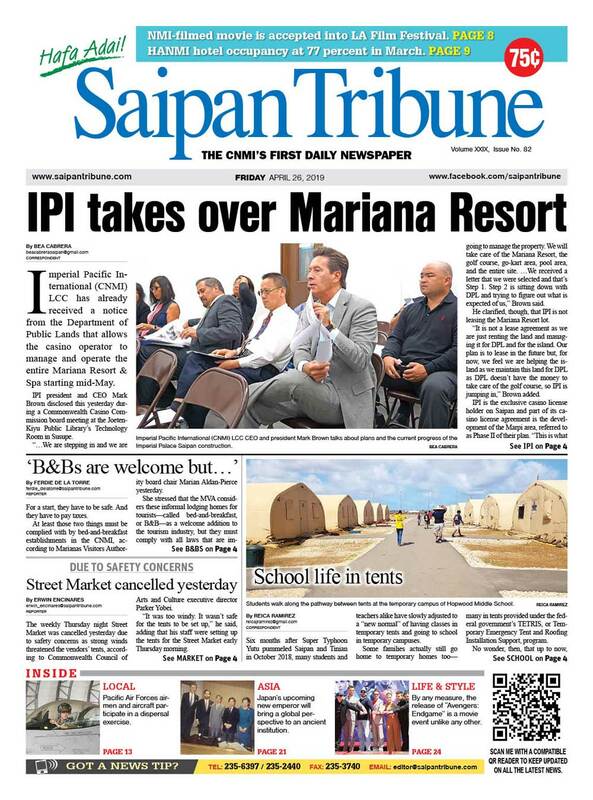 Saipan Tribune tried to confirm the number of injured people, the current condition from the Commonwealth Utilities Corp., and an assessment of recovery but concerned government agencies have yet to reply as of press time. The Francisco C. Ada/Saipan International Airport was also closed to all air traffic and is only open to military aircraft as relief are expected to arrive in the coming days. 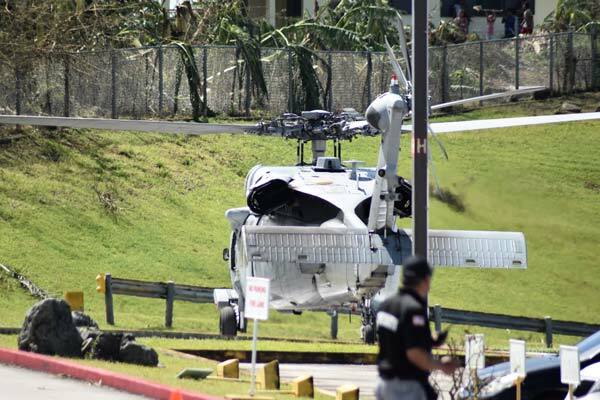 A C-130 also landed on Tinian while several military personnel, believed to be from the Guam National Guard, were at the Commonwealth Health Center parking lot. Sports events are expected to be canceled in the coming days, with facilities like the Oleai Sports Complex and the Koblerville soccer pitch heavily damaged. 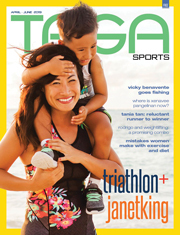 The Ironman 70.3 triathlon scheduled tomorrow was already called off, according to a joint statement released by the Marianas Visitors Authority, Athlonia, and Ironman. The race cancellation was issued Thursday morning. 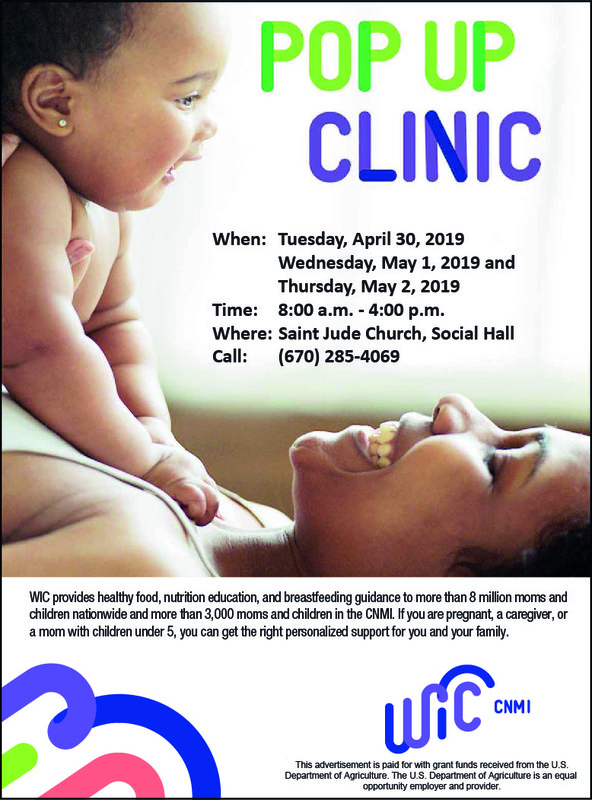 Local organizers will be focusing their resources in the recovery efforts on Saipan and Tinian. There were several Japanese athletes that had already arrived last Tuesday as part of the KFC Triathlon Club. A military plane was bringing food, water, tarps and other supplies, U.S. Federal Emergency Management Agency spokesman David Gervino said. 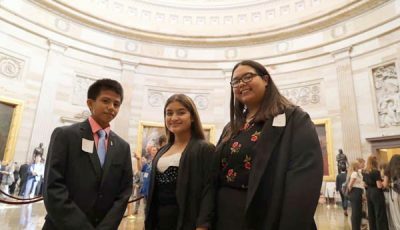 The agency had already significant water and food in place because it had stored more than 220,000 liters of water and 260,000 shelf-stable meals at a distribution center on nearby Guam to prepare for Typhoon Mangkhut, which struck last month. Mangkhut’s effects turned out to be not as bad as expected, so those supplies are still available. The agency is focused on helping restore power, opening sea and air ports and ensuring cell towers can operate on emergency power until utility power returns, Gervino said. One change the agency adopted because of Hurricane Maria, a Category 5 storm that struck Puerto Rico last year, is it has created task forces to tackle different areas such as transportation, communications, food and water and energy and fuel. Federal and territory officials are in constant communication to address each of these areas, he said. Several gas stations finally opened for the public mid-afternoon Friday. Lines stretched more than a kilometer. Manuel Dacuma, 54, said he started queuing at 10:30am. His Hyundai Veloceter, which had some scratches due to Super Typhoon Yutu, was the first vehicle in line at the Mobil Oil Marianas gas station along Beach Road in Garapan when its pumps finally opened at 2pm. “I’ve been here like five hours… For lunch I just bought soda and bread. [I] started lining up at 10:30am,” he said, adding that his car is now running on empty. Aside from the long line of cars, people with gas cans and containers also lined up, with the queue stretching toward the Lollipop’s toy store.